Swami Chidananda Saraswati was President of the Divine Life Society, Rishikesh, India. He is well known in India as a yogi, jnani and spiritual leader. He succeeded as President of the Divine Life Society in 1963, after the death of his predecessor, Swami Sivananda Saraswati, who founded the Society. 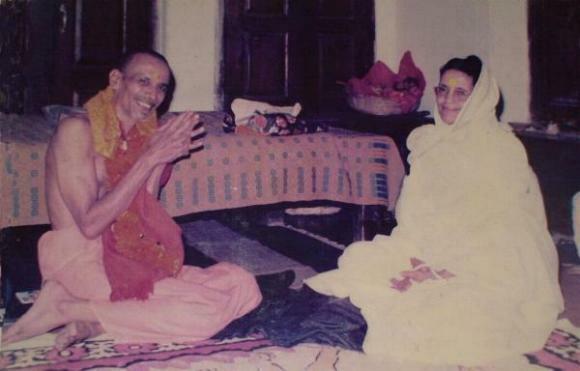 Swami Chidananda first heard about Sri Ma, when in the presence of his guru Swami Sivananda he heard a Bengali Professor related a story about Sri Ma. He was not a Swami at that time but was very much interested in what he heard. In a talk given on 9th December 1990 at Massabielle near Paris he related the story. “Three or four years later an occasion came when I found myself in the holy city of Kashi or Varanasi and there I came to know there was a big ashram of Ma in the holy city and that Ma was actually present there in the Ashram. This was in the month of February in the year 1948. I was staying with an old monk in Varanasi and I requested him to take me to the ashram of Ma. At that time Ma was having performed a very very great spiritual yagna or certain sacrament for the welfare of the world and peace. She had initiated the repetition of a very important mantra several millions of times. It was in the form of repetition of the famous sacred Gayatri mantra, Om bhur bhuvar svah tat savitur varenyam; Bhargo devasya dheemahi dhiyo yo nah prachodayaat. The mantra was being repeated by one hundred Brahmin pandits. Day after day, day after day this repetition was going on. It actually took more than 2 and a half years to complete and it was in progress when I first met Ma. It was an interesting revelation to me at that time. I thought Ma would give darshan as a high personality perhaps sitting on a special seat. But I found her sitting upon the floor giving instructions regarding yagna . I bowed down to her and an old monk said “He comes from Rishikesh and he is a disciple of Swami Sivananda of Rishikesh”. The moment she heard the name of Sivananda she immediately put up her hands and asked me “How is Pitaji? How is Father?” To Sri Sri Ma everyone was father and everyone was mother. Because her consciousness was that of a little girl. She never felt that she was a grown-up lady or woman. The Pure Consciousness of that of a child. Blessed are they who are innocent and pure of heart for theirs is the Kingdom of God. Suffer the little children to come unto me. I did not understand who she was referring to and the monk with me said she is referring to your guru Swami Sivananda. My darshan of Ma in her own ashram in Varanasi was the first event in a long series of a cherished dream I had ever since I first heard of her several years back. Ma is a curious mixture of Absolute lost in the Cosmic Being. Everything is happening by the Divine Will but at the same time accompanying it paradoxically by intense pragmatism and practicality in the field of activity Her advent was to bring about a wide awakening in the inner spirit of present day man. It was to bring about a great spiritual wave that would lift mankind’s life to a higher level. Her one admonishment is God is the One Great Reality and to know him and to experience him is the sole purpose of human existence, and a life that does not strive to attain this experience is no life at all, is useless. Therefore do not throw away this precious human life but be up and doing in order to know and attain that. This was her constant message. Swami Chidananda wrote the following passage about Sri Ma on 24th March 1995, on the occasion of her 100th birth year anniversary. DIVINE RADIANCE ON EARTH SHREE SHREE MA! Worshipful homage to the great Transcendental Reality – the Eternal and lnfinite, the Beginningless, Endless and the Changeless! Salutations to that Being whose symbol is AUM. With great reverence may these written lines constitute loving adoration to the Being who is known as Sri Sri MA; the Unmanifest. That which manifested in Matri-swarup a century ago, in 1896, became named as Nirmala meaning, the pure (devoid of the impurities of Rajas, Tamas and Sattva und of Avidya) and later became known everywhere as the Bliss-filled Mother, Sri Sri Anandamoyee MA! Verily Anandamoyee or Anandrup-Brahman! This article is being a little contribution to beloved Ma’s “Centenary Volume” and is offered as a “shraddha-pushpanjali” to Sri Sri MA’s glorious Ever-Presence! Four or five months back (November 1994) when our esteemed Brahmachari Panuda approached me for an article for the MA’s Centenary Volume I readily agreed and said, “Yes I shall he glad to do so”. I did not realize what I was going in for. Because, when I tried to sit down with pen and paper, I suddenly found myself facing a most unexpected difficulty, it became a very big problem for me. Every time I sat to write or to dictate, the moment I turned my mind to Sri Sri MA, that moment the mind came to a standstill, it stopped thinking and a state of thoughtlessness ensued, all ideas were left behind and the within was uplifted to a level where the only ideas were Just Eternity, timeless Here – Now eternity, spaceless unbounded Infinity. a Stillness beyond Silence action-transcending Non-Duality. For, this has always been what our MA has been to this unworthy son of Sri Sri Ma and a minor servant at the divine feet of beloved and worshipful Gurudev Swami Sivanandaji Maharaj from the time that I first heard about Sri MA in 1945 through the narration of (Dr.) Professor Mahendra Nath Sirear, I felt that I was listening to the description of a rare divine phenomenon and not to the description of any human person or human individual. I was just rooted to the spot and listening carefully with a thrill and an awe also, I felt that I was listening about something that was very close by and which was near and familiar to me even psychologically and spiritually not about something or of some “being” either far away or unfamiliar. My first personal darshan of Sri MA was to follow fairly soon after, in February of 1948. Filled with an intense desire to share this rare experience of his with his Co-philosophers and colleagues in his vocation, he made haste to contact his friends who held top posts in the philosophy department of the prestigious Fergusson College in Poona and invited them to Calcutta to meet this mystic who seems to be ever abiding in a Divine state of Consciousness. The outcome of that memorable meeting became a turning point in the lives & views of these eminent personalities. They could hardly believe that. a young lady with very little schooling in childhood could effortlessly reply to the questions they kept on asking her over a period of several hours. They could not understand the secret source of Her astounding illumined wisdom. I decided that some day God may grant me an occasion of being in this presence. Because, the word “Dakshineswar” had a very special charm and power over me the fact that the great philosophers had this experience of dynamic divinity at Dakshineswar made me feel that there must be some affinity, between the Divine mother Bhava Tarini and this Divine presence. In 1947 December there was some illness due to Malaria in my body and Gurudev Swami Sivanandaji sent me to a doctor devotee in Nagpur for treatment. After 2 months in Nagpur I requested permission from Gurudev to visit Varanasi and Prayag Raj on my return journey. 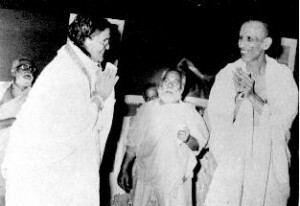 Gurudev readily agreed and I ,journeyed to Kashi in February 1948 and stayed for 10-12 days with an old Sannyasi Gurubhai of mine. One day he offered to take me to the Sri Anandamayee Ashram and get me MA’s darshan. I readily and eagerly agreed. He took me Shivala Ghat, Bhadaini and at that time a great sacred Yajna was in progress in the Ashram. It was MA’s SAVITRI MAA Yagna for which the “jyoti” was brought from the perpetual fire at Dacca. We were received very cordially and taken to MA’s presence, when the Old Swami informed MA that we were from Rishikesh Sivananda Ashram. MA puzzled me by asking “pitaji kaise hai” (how is father?) after making inquiries about my Sadhana etc. MA gave us some Prasad and us we were departing she raised her folded hands and said. “give my pranams to father”. To me it was like a visit to some celestial region distant from earth. I did not note the appearance of Sri MA or her features, but I felt her presence. Ever since this first visit and darshan I have never been able to identify or regard Sri MA as a “person” but always she has been to me an Impersonal Presence, The atmosphere around Sri MA is fully divine. It is permeated by a quality of Timelessness. When one is in Sri MA’s presence one’s consciousness is uplifted to a higher level. The ultimate declaration of Jagatguru Adi Shankaracharya “Brahma Satyam Jagat Mithya” become a fact for the time being. This is what MA’s presence does even now. But then, Her ways are “Vichitra” and MA is a paradox of very practical pragmatism and pure Transcendentalism. This is not so difficult to understand when we consider the manner in which even the “Avataras” like Sri Rama, Parushurama and Lord Krishna behaved and acted in certain circumstances of their divine life. Like any ordinary human being they exhibited moods and reaction that could belie their Divine origin and Divine status. This is known as “avatar-lila”, and it is well recognised that such outer lila did not in the least effect their full awareness of’ their Divinity. This has always been so with Sri Sri MA. So. she was able to move act and “react” spontaneously upon all levels of the outer human world of Vyavahar. A perfect blend of the Pragmatic and the Transcendental.She could give secular advice to ordinary devotees immersed in samsara. 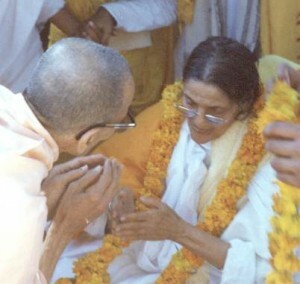 She could advise & guide sadhakas on the inner spiritual life as well with effortless spontaneity and all the whole time Ma was ever abiding upon Her own divine level where Nothing ever happened, Nothing is happening, Nothing will ever happen. All is just as it ever ” IS” And again. Just us the motionlessness, integrity and non-duality of the great ocean is not in any way effected or altered by the tumultuous movements of the innumerable waves upon its surface even so the variegated movements and activities of Sri Sri Ma’s apparent outer personality did not in any manner effect or alter the inner depths of Her divine consciousness. She was always in Her Sva-sthana” and in Her “Sva-avastha”. Her very being itself was Her message and Her teaching. However, in the field of our “Vyavaharica Satha” the meticulous observance of the minutest details holy rituals of our modes of worship and observance of scriptural injunctions of Karma kanda was an education in itself. She oversaw all arrangements upon special occasions and saw to it that everything was done to perfection. She was a guide, friend and teacher to the devotees of rural arts and spoke to each one according to each one of his or her evolution and understanding. She was fully aware that in this world of men nothing was permanent and lasting. But, so long as one was hero and so long as one is in a state of identification with this physical body, the world is very much real (though in a relative sense) and in need of such instructions and guidance that could be grasped by them in their present level. This recognition and the provision to come down to their own level of consciousness. and be to them what. they needed at that moment was the beauty and the marvel of the moments of Ma’s grace. Whenever and whatever view and opinion learned monks, scholars and devotees expressed about MA, she neither said yes or no, neither agreed nor denied, at times she would gently say, “Baba it is you who are saying this” meaning thereby “I am what I am, know yourself and then you will know me, who knows, then perhaps you will not even need to know me!” This is Sri Sri MA. The light of Divinity shining upon this world of mankind. Divine Radiance on Earth.